Over 6ft in length, the longbow was capable of killing a man at over 200 yards. The best bows were made of yew, cut with the heartwood on the inner side. This compressed when the bow was drawn, while the sapwood on the other side stretched. The combination provided immense power. The biggest bows had a draw-weight of up to 150lbs or more, twice that of a modern hunting-bow. The bow needed to be drawn right back to the ear to obtain full power. It required great physical strength to shoot and archers required years of training and practice. 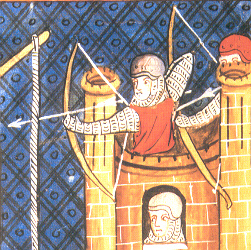 The longbow had a great advantage over the more powerful crossbow: the rate at which the archer could shoot. In a minute, a skilled man could shoot half a dozen arrows, while a crossbowman could do little more than discharge a single quarrel. The gravitational pull as an arrow shot with a high trajectory fell towards its target meant that it remained extremely effective even at long range. Specialised arrowheads were used. A narrow bodkin head could penetrate armour; a broader bladed head was capable of inflicting appalling wounds. Historians argue as to whether the longbow developed from an earlier shortbow, which would be drawn to the chest, not the ear. The argument partly hinges on whether there was a qualitative difference between a bow 4ft in length and one 6ft. No contemporary written sources justify any such distinction, and longbows were not an innovation of the 14th century. However, it was not until that period that the longbow really came into its own in warfare, not as a result of technical innovation, but because it was then that it was used on a massive scale. Under Edward III, the English government, for the first time, supplied armies with longbows and arrows in vast quantities from the central depot in the Tower of London. Massed English archers caused havoc in the battles of the Hundred Years War. They were particularly effective against cavalry; horses were maddened and became uncontrollable as arrows found their targets. No English longbows survive from the Middle Ages, but the 16th century wreck of the Mary Rose yielded a large number of bows, 6ft to 7ft long, which are almost certainly little different from those used earlier. Strikingly, one had a knobbly appearance, from the knots in the timber, just like the bows in some 14th century illustrations. An enactment of Henry I in 1100 stated: ‘If anyone in practising with arrows or darts should by accident slay another, it would not be visited against him as a crime’. Sad news indeed for the families of the Abbot of Lagny, who was accidentally shot in the eye in 1163, and the un-named woman shot by men practising with the bow in 1209. Many believe that the English learnt the use of the longbow from the Welsh. This may be true. It is certainly true that English armies in the Hundred Years War included both English and Welsh archers. In this context, of course, the Welsh were serving in English armies, and it is fairly standard practice, therefore, to refer to ‘English longbows’ and ‘English longbowmen’. It should be said that longbows are known in British prehistory – examples have been excavated from waterlogged deposits of Iron Age date in Somerset, for example – and they appear to have featured in Anglo-Saxon and Viking warfare as well. It is possible that the weapon has a much longer history in Britain than is generally assumed. Certainly, we should regard the remodelling of English armies in the late 13th/early 14th centuries as armies with large numbers of longbowmen as very much a reworking of an old tradition, no doubt especially vibrant in Wales at the time, but most probably not restricted to there. The “theory” that the Welsh originated the longbow is based on ??? You can’t get a patent for something that has been in use since the Stone Age. No longbow [or longbow arrow] remains have been found in Wales nor is there any written reference identifiable as a longbow. Welsh archers in the Hundred Years War were issued English livery longbows. We have enough facts and ancient references that we have really no need for fantasy “theories”. [like the two finger salute].. The south Welsh were documented as using the ‘longbow’ during the Norman invasions of Wales in the C11th and C12th (see Giraldus Cambrensis etc). However, the ‘longbow’ was also used at an early date in Scandinavia. It may be that this bow was developed independently in wales, but it is equally likely that it was introduced by the Vikings, who raided Wales in the C9th-C11th. Yes, Welsh archers were recruited and armed by the English crown, but that does not mean that the English invented the longbow any more than the Romans invented the recurve and composite bows used by their auxiliary troops. Re your assertion that no evidence has been found in Wales, so what? Absence of evidence is not evidence of absence. The only bows from the early medieval period, through to the C16th that have survived are those recovered from waterlogged sites. They are made of wood. They disintegrate. To describe the attribution of the longbow to a Welsh original as a ‘fantasy theory’ is not only bad history, but frankly pathetic. “Absence of evidence is not evidence of absence.” I’ve never been terribly sure about this axiom. Methinks it might… might, be a get-out clause sometimes for those who know there is no evidence to support their claims and who still insist on maintaining them. Not finding something doesn’t prove it was never there, but surely it’s a strong indicator… especially as in this case we have much evidence of longbows elsewhere in earlier times. We *know* there were longbows in England as far back as the iron age from the evidence. There is, if I read the above comment correctly, no such evidence for Wales. Conclusive proof? No. Suggestive? Yes I’d say so.